The monsoon clouds are upon us and its time to step out in style with our one true love – Summer Skirts. With midi styles continuing as a core length this season, the wrap style moves forward as a key fashion item. Use oversized O-ring buckles with self-ties as a closure update as well as asymmetric hemlines in heavyweight fabrics such as cotton mixed, suede, leather and bouclé in a relaxed A-line silhouette. Wherever we went shopping we found ourselves flooded and in awe with this style. 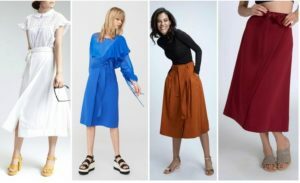 Available in an array of colours these skirts with the right accessories and shoes can bring life to your outfit be it any occasion. Pair it up with a nice striped shirt and you are ready to take the boardroom by storm. A bright skirt with a with a casual cami top makes the perfect dress for that impromptu lunch with the girls. If a party is where you are headed to, skirts are the new dresses on the block. The casual whites: To shop for the summery white skirt click here. The chic & formal tan: The tan skirt adds the perfect dash of sophistication. Buy it here. The dressy wine: The skirt in wine is perfect for the day and dressy enough for the night. Grab it now. The vibrant blue: The gorgeous playful blue skirt is available here. The demure peach: The peach maxi skirt with an off-shoulder top makes for an eye-catching summer attire. Order here.